Over 1,100 people have already expressed their readiness to participate in a project to secure Ukraine's state border, Prime Minister Arseniy Yatseniuk has said. "Over 1,100 people – 1,145 – have signed up for the implementation of the Stina (Wall) project in order to come and get a job," he told reporters on Wednesday after inspecting the fortification of the state border near the Hoptivka crossing point in Kharkiv region. He noted that a special department on securing the state border would be set up at the Infrastructure Ministry to implement the project and that the work would be coordinated by the State Border Service. It is also planned that Ukrainian engineering institutes will actively participate in further designing. 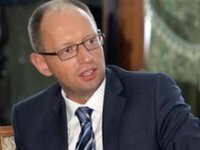 "There are several more tasks apart from the fortification of the border: to support the economy and give people jobs," Yatseniuk said.